It has well been established that there were some regrettable fashions that became popular in the '90s and still haunt us today. But if you thought women's styles back then were odd, just wait until you see what the men had going for them. Because some '90s men's fashion trends were so weird. From rayon shirts to super baggy jeans, these looks will hopefully never make a comeback, although we certainly can remember them fondly. It's true that there are quite a few fashion trends from the '90s that have gotten super popular as of late, and look great paired with 2016 styles. Chokers, jelly shoes, slip dresses, and even denim skirts are just some of those that we're seeing back in action now, and I'm sure there are more '90s style revivals to come. But looking back on the men's looks from about 20 years ago, there's really nothing I can see being sported alongside more classic ensembles from today. I don't know how men in the '90s did it, because the popular trends and styles were so out there. From velcro wallets to jewel colored shades on sunglasses, these trends were just plain old weird. So, here are 13 men's fashion trends from the '90s that are so strange that they are actually amazing. You know I love you, Matt Damon, but this striped rayon shirt is not doing your cherubic face any favors. Don't ask me why people in the '90s didn't just wear cotton. I can totally appreciate a good boot leg or wide leg jean. But the jeans Jay Z is wearing? Those are beyond wide leg. I know your style has much-improved, Jay, but these jeans will always be remembered. You can't have a '90s men's fashion roundup without the likes of the Backstreet Boys! A.J. Mclean's hoop earrings kept me coming back to the B Boys, not going to lie. But the trend was just downright weird looking back. Not only is this a velcro wallet, which many a '90s kid used to store their lunch money and library card, but it's a Kurt Cobain-embellished velcro wallet. Doesn't get any more nostalgia-inducing than that. Another Kurt Cobain-inspired style from the '90s. The Nirvana frontman pretty much defined grunge, this is still a look people reference today, although now it's a bit more subtle. Why did it seem like a good idea for every popular guy at school to wear a puka shell necklace? Another one of life's mysteries, I'm sure. Because a regular collar would be too boring! 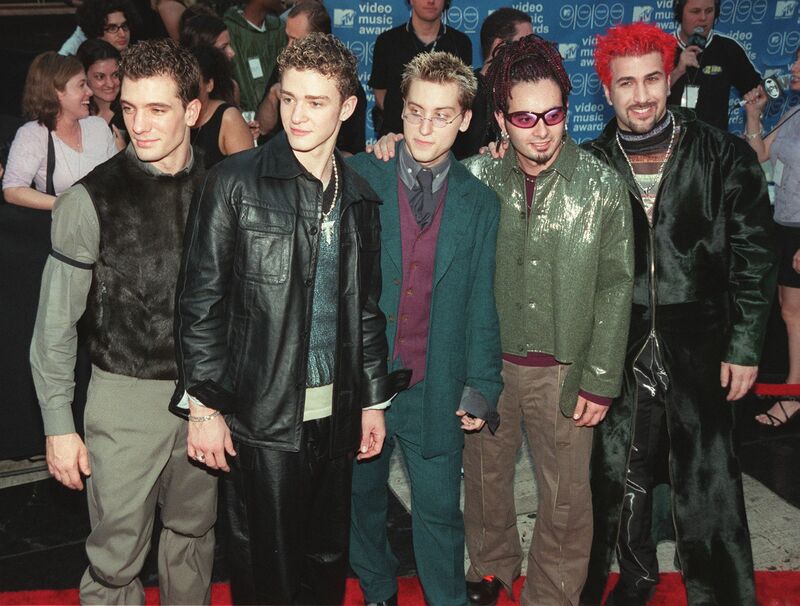 Chris Kirkpatrick of NSYNC was by far the member of the group that was willing to go above and beyond for style. But that green leather jacket? Downright weird. Another appearance from NSYNC proves that they're double offenders when it comes to weird '90s trends, but would you expect anything less from the boy band of the decade? The '90s were clearly a weird time for men's fashion. Props to anyone who made it out alive!